An engine rebuild is a large and expensive job, and choosing the right kit can seem a daunting task. There are a lot of kits for sale, and they may all seem similar but vary greatly in price. Knowing the difference between the various engine rebuild kits will help you shop with confidence, knowing you're getting the right parts for the job at hand. There are three types of engine rebuild kits—re-ring, inframe, and out-of-frame. We'll go through each of these in detail, as well as when you might need them. You can also check out our video for more information. A lot of customers that call in and want to rebuild their engine simply say they need a rebuild kit. Usually, we guess that they want a standard inframe rebuild kit, as that is the most common kit sold. However, there are several levels of rebuild kits to use, based on the state of the parts in the engine and the engine’s OEM. Another important thing to note that can confuse a lot of people, is that ”overhaul kit” is often used synonymously with “rebuild kit,” but it can also specifically mean “out-of-frame kit.” To avoid confusion with the term “overhaul,” we use “rebuild” instead. Also, please keep in mind that this article contains only the general components for these engine kits. For content lists specific to the kit you need, be sure to check the product’s page on our website, or call in to ask one of our parts techs. To download and print a copy of "Rebuild Kit Levels", click here. The re-ring kit is the smallest rebuild kit. It is one of the least time consuming ways to rebuild your engine, but it assumes that your pistons are reusable. 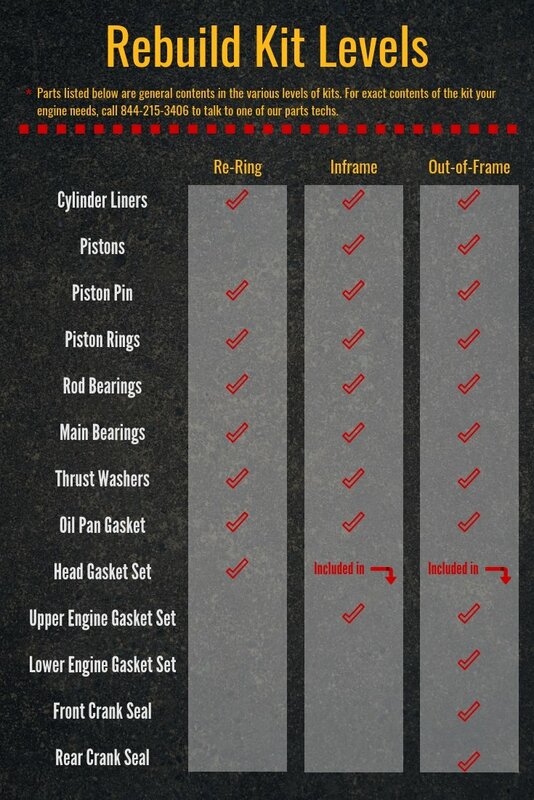 Evaluate the condition of your other engine components before choosing to order a re-ring kit. 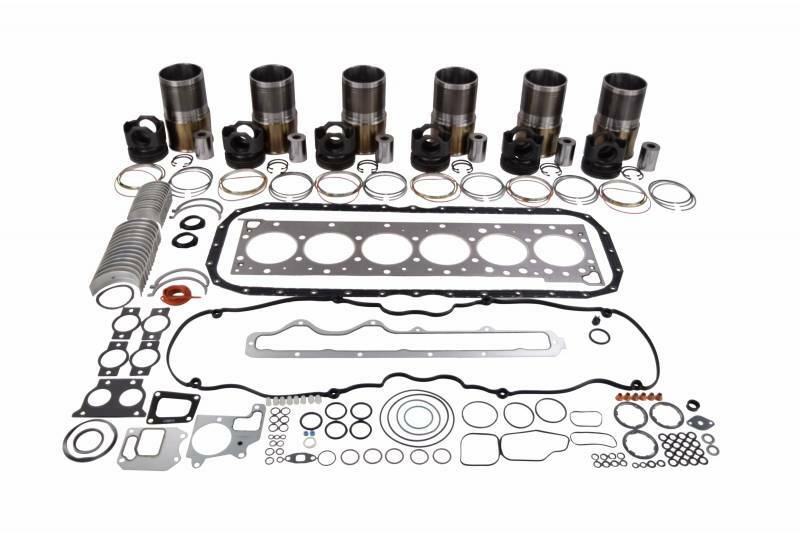 Re-ring kits generally contain cylinder liners (if used in the application), piston rings, connecting rod bearings, main bearings, thrust washers (if used in the application), a cylinder head gasket set, and an oil pan gasket set. The big thing to pay attention to is that re-ring rebuild kits do not include pistons. Sometimes, you may see kits labeled as “pistonless” or “without pistons”—those are re-ring kits. The term re-ring comes from the fact that, even though the pistons in an engine are being reused, the rings should be replaced while you’re pulling them from the cylinder. Therefore, you need to re-ring the old piston. You can see a couple examples of re-ring kits here and here to compare how exact contents differ between engines. A re-ring kit is for people that need to refresh their engine with a rebuild, but still have pistons that are in good condition. All of the more wearable components get replaced, such as rings, bearings, and gaskets. If the pistons are still good, they do not necessarily need to be replaced. This can save a lot of money, in both parts and labor. Labor expense is saved because this type of rebuild can be done while keeping the engine in the chassis. An inframe kit is the average rebuild kit. It is a less time consuming repair than the out-of-frame, but includes more components than the re-ring kit. It's exact parts included depend on the type of engine, so make sure you're buying a kit that fits your engine model. If you're unsure, our certified techs would be happy to help you! Inframe rebuild kits will always include pistons, plus the general piston components, like rings and pins. Unless the engine is a parent bore or sleeveless engine, an inframe kit will also always include cylinder liners and liner seals. Like the re-ring kit, inframe kits will generally also have rod bearings, main bearings, thrust washers (if used in that engine), and an oil pan gasket. There will also be an upper engine gasket set, which is comprised of a head gasket set and a few extra gaskets that fit in the upper engine. A pretty standard example of an inframe rebuild kit can be found here. An inframe kit is the most popular option for a reason. It contains all of the essentials to completely rebuild your engine, including pistons and piston pins. It’s a great option if you don’t think that your pistons are in the best condition and you don’t want to risk potentially having to rebuild your engine again in a few months. As its name would suggest, an inframe kit can be installed while the engine stays in the frame of the vehicle. This will save time and labor, since you don’t have to worry about taking the engine out of your vehicle. An out-of-frame kit has the most components of all the kit levels. It also requires the most labor time to install. But it helps prevent uneven wear, since so many parts are being replaced at one time. It will have the same basic components that an inframe kit has (cylinder liners, liner seals, pistons, pins, ring sets, rod bearings, main bearings, thrust washers (if applicable)), with some upgrades. The head gasket set will be upgraded to an overhaul gasket set, or both an upper engine and a lower engine gasket set. The specifics of what is in an overhaul gasket set varies from engine to engine, but it will generally have all the gaskets and seals you’ll need when pulling the engine from the chassis. These will also include front and rear crankshaft seals in all out-of-frame kits, except for the kits that fit on Detroit Diesel engines. An out-of-frame kit is everything you need and more when rebuilding your engine. It’s for when you really need to overhaul and don’t care what kind of time it takes. In the diesel world’s typically non-creative way, an out-of-frame kit is needed when the engine is being pulled out from the frame of the vehicle. If you’ve got time to spare and a few extra dollars, an out-of-frame is worth it to know that you’re replacing everything you’d possibly need. Be sure to take a look at our large selection of rebuild kits for every type of repair you may need. Still have questions? Please don't hesitate to call us at 844-215-3406. You can also request a quote online.